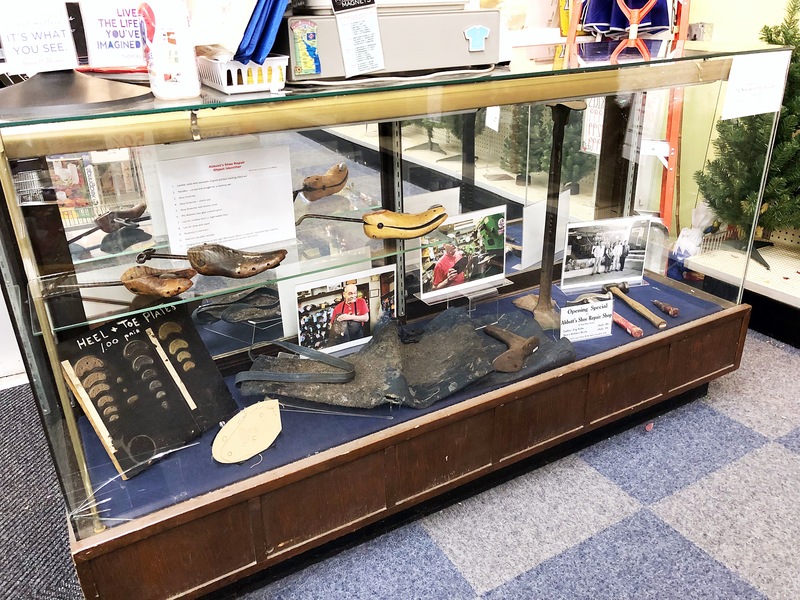 It’s been a while since our last pop-up exhibit, so we’re excited to announce that we have just installed a small exhibit in the store featuring our former Main Street neighbors….Abbott’s Shoe Repair Shop. The exhibit features artifacts and photos from the shop. You can read more about Abbott’s in this article from the Newark Post: Abbott’s Shoe Repair To Close After 65 Years. Fun Fact: The vintage shoe stretchers in the exhibit were originally from the shoe department at National 5 & 10! We gave them to Abbott’s many years ago when we closed down the shoe department. Look for three different styles…a child’s shoe stretcher, an adult shoe stretcher and one with a built in bunion stretcher! So funny to have these things back in the store after all this time. This exhibit is on loan from the Newark Historical Society as part of their traveling exhibit program. If you are interested in Newark history, be sure to visit their website and check out the Newark History Museum in the old railroad station off South College Avenue. Finding the museum is half the adventure! The museum is closed for the season, but will be reopening in March.